The Little Welsh Dresser, a creatively inspiring boutique, full of vintage floral and modern retro styled gifts and decor with an emphasis on Welsh design and origin. 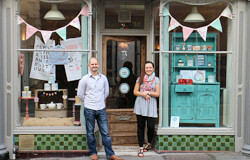 Proud stockists of Chalk Paint(TM), a decorative paint by Annie Sloan. 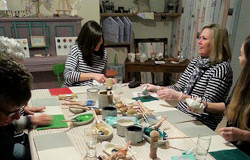 We also run painting workshops at the back of the shop! Paint your own piece of furniture here at The Little Welsh Dresser on Tuesdays and Wednesdays: Ideal for those of you who are either new to Chalk Paint, want some direction, or just don’t want to have to clean up afterwards!